Lunch with Elaine is always a treat. The World Jewelry Museum curator has the old and twisted alleys of Insadong and Samcheon-dong down pat, and is always introduces me, right when I think I have Seoul’s food scene down, to something special. Ok, I am stopping there. This post has been sitting in the edit file of my blog for over two weeks. I have tried many times to write a narrative that goes along with the following photos, but am struggling to come up with much that varies from a series of declarative sentences. So I am going to show, not tell, well, a little bit of telling, with some declarative sentences. Restaurant specifics at the end. 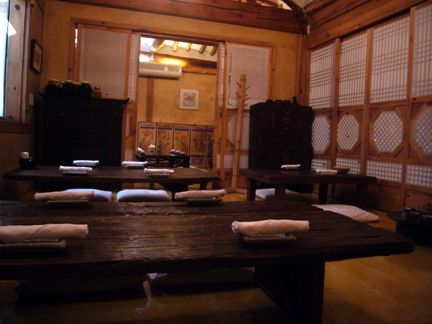 The restaurant is set in a traditional Korean house, hanok. 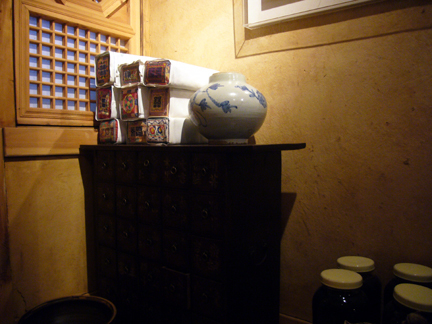 Lunches are not al a cart, but hanjeongsik, set meals. Meals kick off with a soup to stimulate one’s appetite. 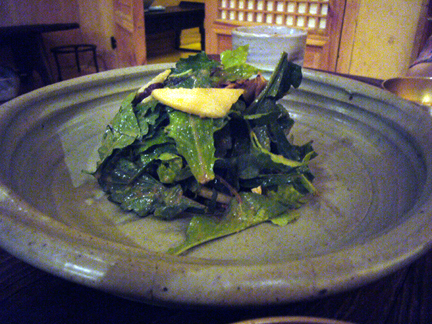 Second course features a wild green salad with dried mushrooms in a sweet pear dressing. 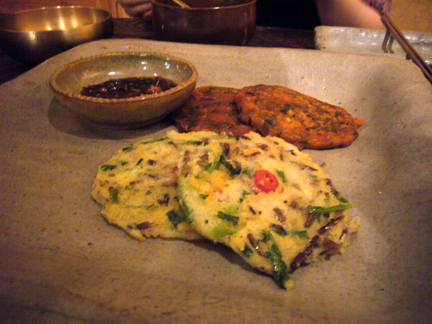 Kimchi and Mungbean cakes, or jeon. 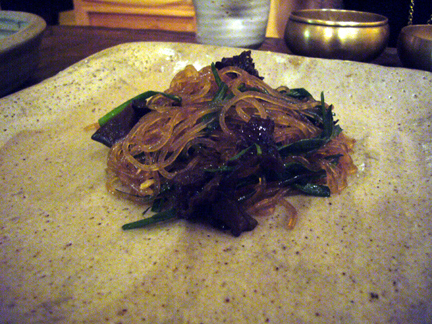 Japchae, noodles with spinach and mushrooms. 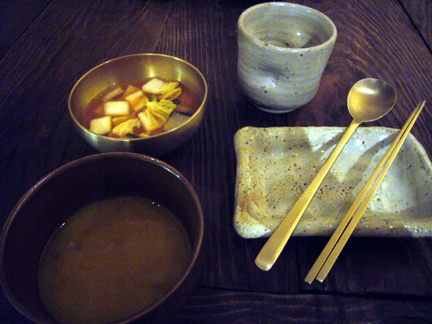 Namul, greens, various kimchis, pickles, and deonjeong jiggae, soybean soup. 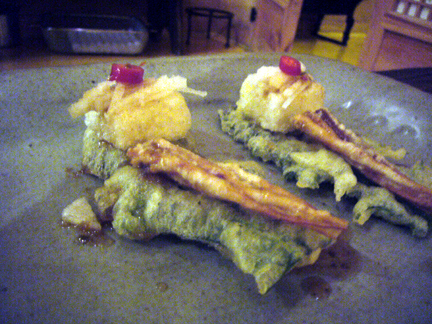 Service, free deep fried tofu and ginseng atop a spear of arugula (rocket). 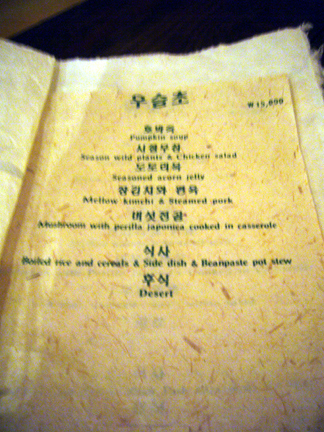 Some English spoken, English menu. Vegetarians are easily accommodated, just ask the set meal you order to be vegetarian. Service can be pushy, but over all pleasant. Hidden in the back alleys, easiest to start from Anguk station, exit 6, head left, and turn right down the lane at the Jongro Police station. Follow the brick alley through a series of right and left turns (follow the green sign for the tea shop) Nwui Jo will be on your right. One of the best dwingjang jjigaes I had was in Insa Dong. Like you pointed out, the trick is to go down one of the narrow alleys. The restaurants on the strip are for the Japanese tourists. 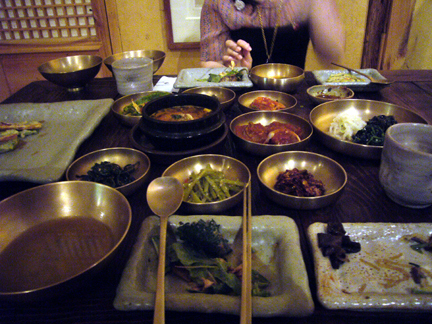 Eun Jeong (a recovering Japanese tour guide) always says to not eat on the strip. I gotta check out the one that you went to, though. Great post! I think it’s fine to let the pictures do the talking! I was just looking for an idea for a restaurant to take someone for a special, but low-key dinner. Think this is a top candidate.